Welcome to the world of plant-based living! I’ve put together a list of my top resources, sites and most useful posts that I hope will support you in integrating more health, wellness and sustainable choices into you daily life! I have personal experience with every recommendation listed on this page, and update it regularly. Some of the links below are affiliate links, which means that if you choose to make a purchase, I will earn a commission. This commission comes at no additional cost to you and helps support Vegan Chickpea. Please understand that I have experience with all of these companies, and I recommend them because they are helpful and useful, not because of the small commissions I make if you decide to buy something. 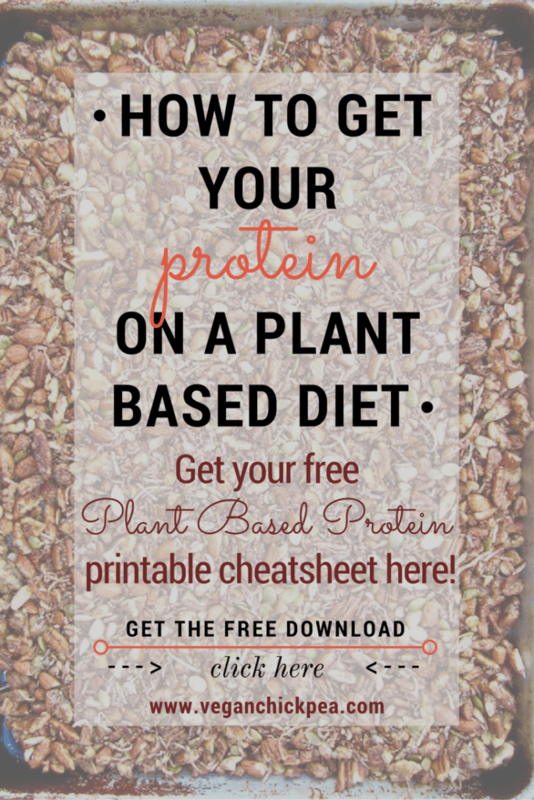 Thank you for trusting me to provide you with healthy plant-based living inspiration! The Top 10 Pantry Staples for a Vegan & Gluten Free Diet – I put together this list of pantry ingredients along with corresponding recipes so you can stock your pantry for success! The Top 12 Most Popular Recipes on Vegan Chickpea – A great roundup outlining the most popular recipes on this site during its first year, so if you’re not sure what to make, get started here! 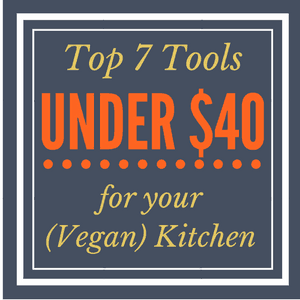 Top 7 Tools Under $40 for your (Vegan) Kitchen – These tools are great for any kitchen, no matter your dietary choices! My favorite and AFFORDABLE kitchen items. Use discount sites like LuckyVitamin.com – seriously some of the cheapest prices around with thousands of products, this is one of my go-to stores for shopping online for groceries, toiletries, cleaning supplies, etc. Get a membership to Thrive Market – a healthy online grocery store at wholesale prices, offering extra daily discounts, freebies and more. I adore Thrive Market and definitely think it’s worth the annual price of $59.99 – think of it like Costco or Sam’s Club. I wrote a post about why I love Thrive Market and my favorite buys, which you can read here. BONUS: Get an extra 25% off + free shipping using the link above! Online Cooking Classes: Want to learn how to cook delicious food in a really approachable way? Check out this Vegan Fusion online video course with Chef Mark Reinfeld, who I’ve personally trained with and highly recommend for anyone wanting to learn about the fundamentals of plant-based cuisine. You can read all about my time training with Mark here. BONUS: Get 40% OFF EITHER OR BOTH Vegan Fusion courses, which equates to $100 off the bundle or $50 off either one you choose! That’s only $150 for both courses. Simply click here to register with the special code SNEWMAN. Cookbook: Also, Chef Mark’s cookbook Healing the Vegan Way is one of my favorite vegan cookbooks with over 300 approachable recipes that actually taste great and are super healthy! Plus, you’ll learn a lot about the healing power of foods and what you can eat for certain ailments or health conditions to support natural healing. Meal Delivery: If you’re too busy to cook but are committing to eating more plants, an organic, vegan AND gluten free meal delivery service like Veestro could be perfect for you! Check out my review of Veestro here. Support cruelty-free fashion with sites like Urban Expressions that don’t compromise on ethics or style! These chic animal-friendly bags are so gorgeous; I have a backpack, makeup bag and purse from here, and the prices are actually affordable. I LOVE LOVE LOVE this purse – so practical (it’s huge inside) and yet elegant with the textured braiding, I highly recommend it and have received multiple compliments on it! Another popular 100% vegan brand is GUNAS, an independent high fashion label from NYC that sells beautiful bags, wallets and shoes. Note that this is the one recommendation on this page that I don’t have personal experience with as I haven’t personally bought from GUNAS yet, but it’s a coveted and well-known brand. LOVE GOODLY is a super fun way to discover cruelty-free, natural and non-toxic beauty, skincare, wellness products and eco accessories for a minimal cost. Every other month you receive a box of 4-5 products that are always valued at over $85+! (The box is $29.95) They also have an online shop where you can purchase hundreds of safe, natural vegan products. Interested in starting a blog or website? Here’s a post on What I Learned my First Year of Food Blogging + 7 Tips for How to Start a Blog. I taught myself everything blogging-related, including how to build the site and make money without hiring anyone – so you can do it, too! My number one recommended resource for starting a food blog is to join Food Blogger Pro, a membership site with video courses on everything food blogging related, monthly webinars, a community forum and more. If you really want a foundation for how to start a food blog, I highly recommend investing in a resource like FBP that will give you the overall structure, frameworks, education and how-to’s that you need to be successful. The membership is only open twice per year for enrollments, so go ahead and sign up for the waitlist today! If you need a domain name and hosting, I started with and still use Bluehost. WordPress theme and framework – I highly recommend starting your blog on WordPress. It gives you the most flexibility and I don’t think there are many bloggers who disagree. You can get free themes, but if you have a specific style you’re after and don’t want to hire a web designer out the gate, then I recommend picking a theme you love, even if it costs a little bit extra up front. I use the Foodie Pro Theme with Genesis Framework by StudioPress. The Genesis Framework gives you some easier design options built into WordPress that have made styling easier to do on my own. Learn more about StudioPress Sites here!